According to the National Association of Homebuilders (NAHB), building a new house generates an average of 7,000 lb. to 12,000 lb. of waste. That’s as much as 70 cu. yd. About 40% of that waste is wood. Wouldn’t it be nice to save 40% on your lumber bill? Or to carry 40% fewer studs up a ladder? Given these numbers, it should be easy to find ways to reduce the amount of trash that’s generated and recycle what’s left over. In fact, several studies conclude that something on the order of 80% of jobsite waste could be recycled. As tipping fees for waste disposal rise, some builders have learned that recycling is cheaper than throwing things away. Much of waste management is common sense. Start by looking at what comes to the job site (framing lumber, siding, roofing, etc.) and reducing it where you can. Adopting good building practices, such as advanced framing, reduce waste as well as improve energy performance. Glass, paper, plastic and other materials can be sorted and offered to a recycler. There are plenty of opportunities. Cardboard, for example, is used to wrap everything from appliances to rolls of peel-and-stick membrane. It’s easily recycled but still accounts for nearly 30% of job site waste by volume. Unlike a more conventional approach, green building relies on teamwork from every subcontractor on the site. Subs should understand that anything they do during construction has the potential to affect the work of another, as well as the overall success of the project. No one can work in a vacuum. When everyone has a stake in the outcome, it’s much more likely to result in a high-quality home that meets the expectations of its designers. Take, for example, the importance of preserving the air barrier. This isn’t any single person’s job. Framers, window installers, siding installers, drywall contractors, plumbers, and electricians all have roles. Framers. Framers have been aware of some air barrier responsibilities for years — for example, the need to install sill seal between a foundation and mud sill. 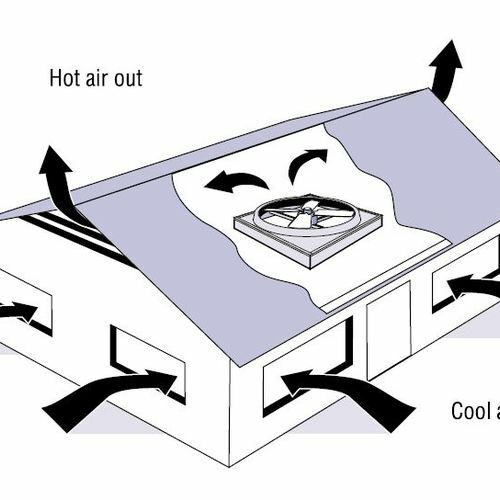 They may not recognize other opportunities for improving the air barrier, however. Install strips of polyethylene at the intersection of partition walls and exterior walls and above partition top plates. Regardless of the details on any particular house, it’s important for framers to know where and how the air barrier is created and the importance of keeping it intact. Window installers. After new windows are put in, it’s important to seal the gap between the rough opening and the window frame. The usual method is to use spray foam. Installers of replacement windows sometimes skip this step. When an insert replacement window is installed in place of an old double-hung window, pulleys and sash weights should be removed, and the sash-weight pockets should be sealed to prevent air infiltration. Depending on the available access, the pockets can be filled with a piece of rigid foam held in place with spray foam, or the pockets can be entirely filled with spray foam injected through a series of drilled holes. Siding installers. If a builder expects taped housewrap (or foam sheathing) to be an integral part of the air barrier, that fact should be explained to the siding installers. For example, it is fairly common for housewrap to be damaged by aluminum ladders. Everyone on the job site should know that any rips in the housewrap must be repaired. Hose bibs, electrical meters, doorbell boxes, and boxes for outdoor lights are other places where the air barrier can be compromised. Drywall contractors. If a builder has decided to use the airtight drywall approach (ADA) as an air barrier, it is obviously important for drywall hangers to understand where gaskets are required. Plumbers. 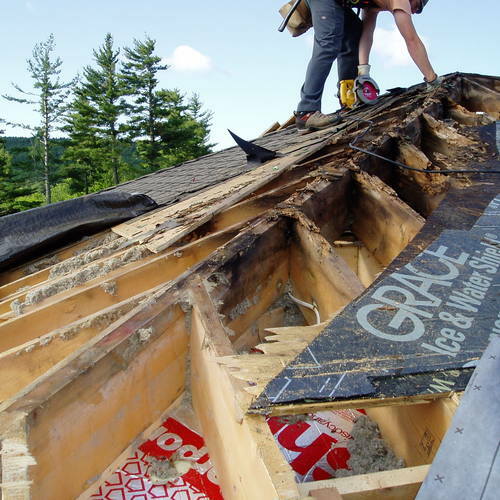 Plumbers have a largely undeserved reputation for being “Sawzall lumberjacks,” but it pays to make sure they understand where the air barrier is and how important it is. Exterior walls behind tubs and showers. Holes in the sub-floor to accommodate bathtub traps. Holes into attics for vent pipes. Wall and floor penetrations for gas piping. Electricians have similar responsibilities. If a job includes the use of airtight electrical boxes, that information must be conveyed to the electrical contractor before the job goes out to bid. Recycling and waste reduction are two priorities on a green building site. Reducing waste is not a high priority on many job sites. An average new house produces tons of waste, which is usually thrown in a dumpster and carted away when the job is done. Reducing potential waste and recycling as much as possible helps lower costs and reduce the environmental impact of construction. In some instances, building materials salvaged in one phase of a project can be used in the next. Reducing material waste begins in the house’s planning stage. Use standard material dimensions and layouts that maximize the use of each material and minimize cuts. In general this requires using a 2-foot design module where the side of the house parallel to the primary joist span is evenly divisible by 4 feet and the length perpendicular to the primary joist span is evenly divisible by 2 feet. 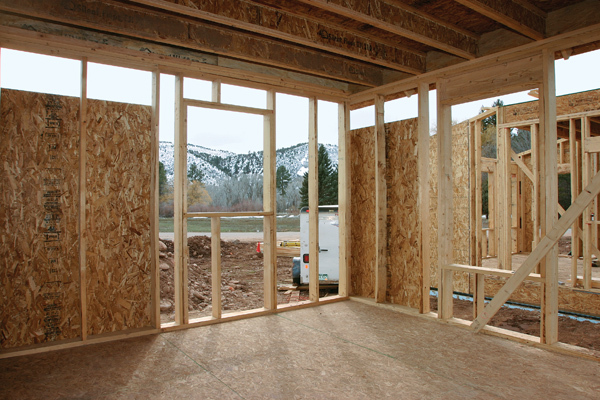 One of the most important strategies for reducing the amount of framing lumber in a house, called advanced framing or optimum value engineering (OVE), has the added benefit of improving a building’s energy performance. OVE typically uses 2×6 studs on 24-inch centers rather the traditional 16-in. o.c. Increasing the stud spacing in the floors and walls can eliminate approximately one-third of the lumber compared to 16 in. o.c. framing. A traditionally framed house also has redundant framing at doorways, windows, and corners. By calculating the actual load requirements, an OVE-framed house properly sizes headers in bearing walls and uses single plates, two-stud corners, and ladder blocking at interior/exterior wall intersections. OVE also eliminates cripple and jack studs and headers from nonbearing walls. Reducing the amount of framing lumber increases the insulation in the walls and allows fewer opportunities for thermal bridging. Generate detailed cut lists from the plans. Use some variation of prefabricated construction. At the extreme end of the scale is modular prefabricated construction. This technique not only eliminates waste at the home site, it minimizes waste at the factory site because of the standardized production framing that uses offcuts in other modules. Factory-built components on a smaller scale than modular construction also reduce waste. This includes engineered floor and roof system (trusses) and panelized construction where wall, roof, and floor components are ordered, cut, and assembled in a factory and delivered to a job site where the pieces are assembled. SIP panels are another variety of panelized walls and roofs that eliminate studs and most job-site waste while creating a very tight, well-insulated envelope. 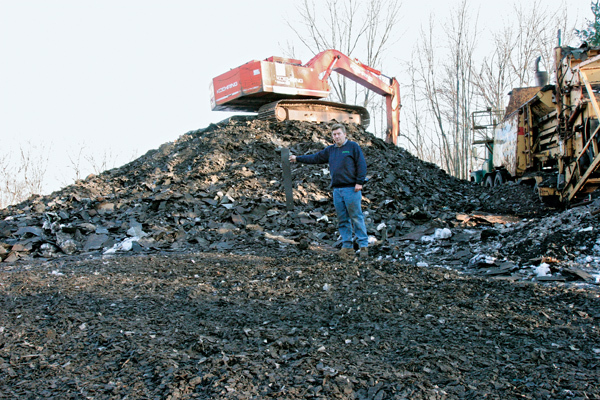 Grinding trees and brush into woodchips for use as mulch is preferable to carting the debris to a landfill. In 1999 the National Association of Home Builders Research Center estimated that home construction produced 1.3 million tons of solid-sawn wood waste. Clean wood waste—not painted, stained, pressure-treated, or laminated products—can also be turned into mulch. Spread over the surface, mulch helps soil retain moisture and moderate its temperatures, and adds nutrients to the soil as it decomposes. If you add chipped wood to the soil, plow it under. Although wood chips help aerate the soil, their high carbon and low nitrogen content can actually tie up nutrients and affect the health of the top layers of soil. You should check out this option with a local soils extension agent. Job-site grinding of gypsum board for on-site use as a soil amendment is another option. Gypsum is commonly used to improve soil tilth, and research has shown that clean gypsum board cut-offs can be ground for exactly the same benefit. Packer Industries, a Building America partner, produces job-site grinding equipment that can handle several types of common construction-site waste materials, including wood, gypsum board, roofing shingles, and even cement block. • Clean wood waste, which can be used as fuel at some wood-fired electric power plants and as a bulking agent in large-scale composting operations. • Cardboard boxes and packing materials, and beverage containers, which should be recycled on the job site just as they would in a household. The key to successful job-site recycling is a detailed plan posted so that everybody knows what is expected. Separating materials into clearly marked recycling streams is important. Each recyclable material should have its own receptacle. Another strategy is to forgo the Dumpsters and use piles surrounded by fencing for each recycled material. Then everybody can see what is being thrown away, and where. Most of the materials found in a Dumpster at a typical construction site can be recycled, but make sure you or your hauler has identified markets for each material beforehand. Remodeling projects present their own job-site challenges. A certain amount of demolition always precedes new construction. Controlling dust and being aware of potential hazards in old building materials are important for the safety of homeowners as well as workers on the site. Consider reusing plumbing fixtures, cabinets and other building materials. Putting salvaged materials back to work is green on many levels. It reduces the burden on local landfills, spares the raw materials that would go into newly manufactured goods, and cuts transportation costs. Protect materials during construction. Many building materials are easily damaged if they’re stored improperly on site, leading to unnecessary waste. Make sure to follow manufacturers’ recommendations on how materials are stored before use. 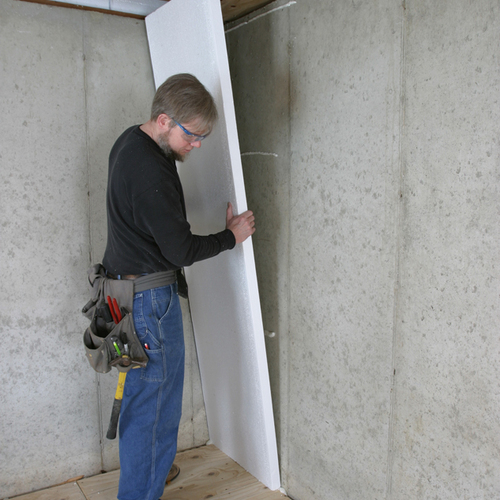 Gypsum drywall can absorb contaminants such as volatile organic compounds, degrading indoor air quality later. Drywall should be stored in a well ventilated area if it’s not going to be hung immediately. Keep smoking outside or ban it altogether. Smoking has practical as well as health risks. The hazards of second-hand smoke are by now well documented. Homeowners may find the practice offensive, and there is always a risk of fire around piles of sawdust and wood scrap. Keeping the job site smoke-free is common sense. 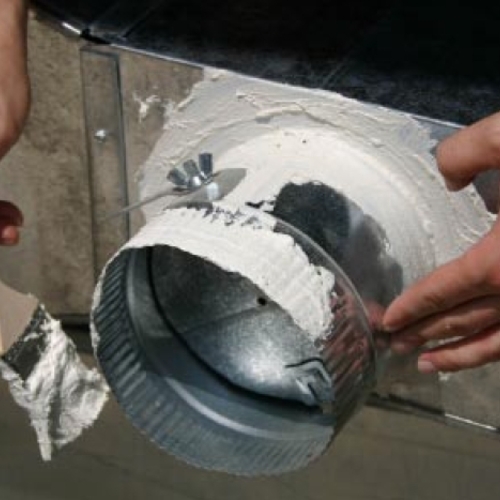 Keep debris out of air ducts. Sawdust, sand and other contaminants can easily find their way into air ducts during construction. 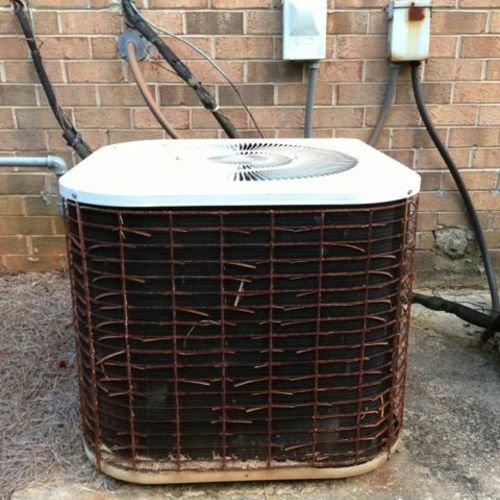 Floor registers and vents should be temporarily sealed after they’re installed, or the duct system thoroughly cleaned after construction is complete. Connecting saws and other power tools to a dust pick-up, using wet saws to cut hard materials and placing floor mats at all entrances can reduce the amount of material that’s tracked into the house. A larger version of this video-visit and more information about the house. 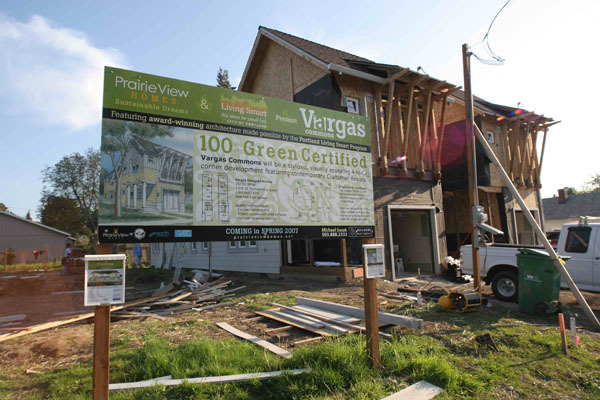 LEED for Homes MR1 (Materials & Resources) offers up to 4 points for advanced framing. MR3 has up to 3 points for construction-waste reduction. Earn an innovation point (ID3) for outstanding diversion during deconstruction (existing building). NGBS Under Ch. 6 — Resource Efficiency: 7 points for construction waste management plan (605.1); 7 points for minimum 50% on-site recycling (grinding & site application) of construction and land clearing waste (605.2); 3 points for off-site recycling of 3 materials (additional points for each additional material recycled) (605.3).